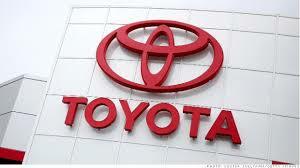 Toyota announced Wednesday that it still holds the title as the world’s largest automaker. Totaling its 2014 sales, Toyota sold an astonishing 10.23 million vehicles, besting Volkswagen AG’s 10.14 million vehicles. Coming in third was GM with 9.9 million vehicles. Toyota’s boom marked the first time in company history that it topped the 10 million mark (they sold 9.98 million in 2013). 2014’s numbers also mark the 6th time in 7 years that Toyota has held the top global spot, with their only loss coming to GM in 2011 after Toyota’s production sank due to natural disasters. Before taking the reins as the world’s largest automaker back in 2008, GM of course held the spot for over 75 years: 1931 to 2007. Despite coming in 3rd, GM is still pleased with their total intake as they broke company sales records for the second straight year. “GM is making solid progress and has good momentum. Our customer focus, the new cars, trucks and crossovers we launched in China and North America, technologies like OnStar with 4GLTE and the revitalization underway at Opel helped us achieve another record year, despite very challenging market conditions in different parts of the world,” said GM CEO Mary Barra. 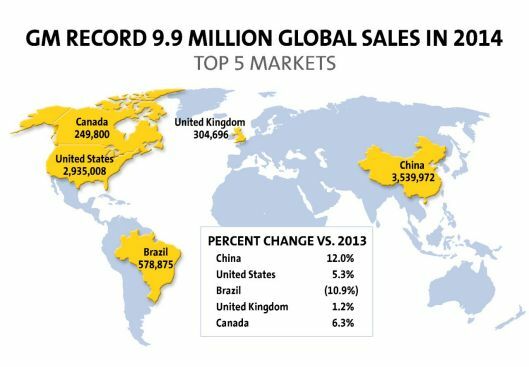 One of GM’s biggest growth in 2014 occurred in China, where they grew an astonishing 12 percent in regards to sales. As far as Volkswagen goes, its sales rose about 4.2 percent worldwide as they also topped the 10 million mark for the first time in company history. In the past 10 years alone, Volkswagen has doubled its sales. Like GM, much of Volkswagen’s growth last year came in the Asian market as they sold more 4 million vehicles, up 11.3 percent from 2013. Moving forward, Volkswagen says that they plan to expand more into the American market as part of their goal to become the world’s largest automaker by 2018. This entry was posted in GM, Toyota, Volkswagen and tagged $10 million, global, GM, sales, Toyota, Volkswagen. Bookmark the permalink.